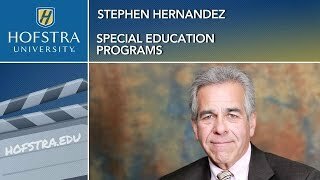 Stephen Hernandez is a specialist in teacher certification, special education and early childhood special education. 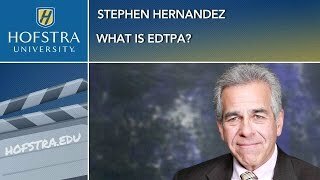 Stephen J. Hernandez has been a member of the faculty in the School of Education at Hofstra University since 2004. In addition, he has extensive experience as an adjunct professor at other area colleges, teaching courses in special education, disabilities, child development, psychology, and nonprofit management. 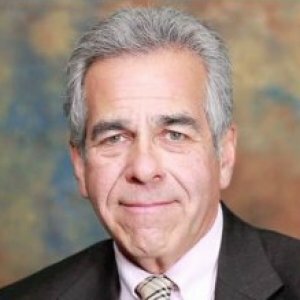 Dr. Hernandez earned a BA from Fordham University, an MS in Education from Long Island University-Brooklyn College, a Professional Diploma in Educational Administration from Fordham University’s Graduate School of Education and his EdD from Hofstra University. In addition to Dr. Hernandez’s work in academia, he has worked for more than 30 years serving individuals with special needs. He has held positions ranging in scope from direct care service provider to classroom instructor to various administrative capacities. Most recently as an administrator with the Brookville Center for Children’s Services at Marcus Avenue in New Hyde Park, NY, as well as at United Cerebral Palsy of Westchester in Purchase, NY. Dr. Hernandez’s areas of research include collaborative teaming, interdisciplinary intervention and the management of children’s challenging behavior. His teaching interests include understanding emotional and behavioral disorders of children and youth as well as the assessment and diagnosis of young children with developmental delays and disabilities. Dr. Hernandez is a member of the Council for Exceptional Children, the National Association for the Education of the Young Child, The American Academy of Special Education Professionals, and The International Association of Special Education. Dr. Hernandez also serves on several statewide boards representing children with and without disabilities, including the New York State Council for Exceptional Children as well as the Association for the Education of Young Children. The United States Department of Education awarded Hofstra University’s Department of Special Education in the School of Education a $1.25 million grant to launch the MSEd in Special Education Early Childhood Intervention to train highly qualified teachers who will serve the needs of preschool age children (birth to 5 years) with disabilities. This is a five-year grant, which began in 2013-2014. Hofstra’s Department of Special Education receives $250,000 per academic year. The U.S. Department of Education awarded a $1.25 million grant -- $250,000 per year over a five-year period -- to Hofstra University’s Early Childhood Interdisciplinary Professionals (HECIP) program to prepare highly qualified teachers to support young children with disabilities and their families. Through the program, a total of 51 college graduates (broken up into four cohorts) will be recruited for a dual certification master’s degree program in Early Childhood and Early Childhood Special Education and trained to serve young children with special needs. The grant is provided through the Department of Education’s Personnel Preparation program, which helps address needs for qualified special education personnel and ensure that those personnel have the skills and knowledge needed to serve children with special needs. Collaboration in education is seen as a legal mandate, best practice in teacher practice, and necessary for the inclusion of children with special needs. Over the years, there have been a number of evolutionary incarnations of the collaborative model, each possessing various ingredients identified as important, if not essential, components of a successful professional relationship. This article provides the reader with a review of the literature regarding collaboration in education, particularly in reference to the service of students with special needs. In addition to identifying those aspects of collaboration that have been deemed critical to its success, this article also discusses the characteristics found to challenge effective collaboration.